Hey Kids, Visit The Chompers Kids Zone This School Holidays. Continuing our educational philosophy, the team at Baldivis Family Dental believe in a strong early interventionist approach to children’s dentistry and helping them to develop a healthy, life-long oral care routine. With an understanding as to how much first experiences can affect ones approach to dentistry, our caring team are dedicated to ensuring that your children’s first experience and introduction into dentistry is a positive one. They even walk away with a special gift from our team! Click here to view an outline on what your child can expect during their first experience including dressing up as a dentist, meeting Rex the dragon and playing with the dental chair. 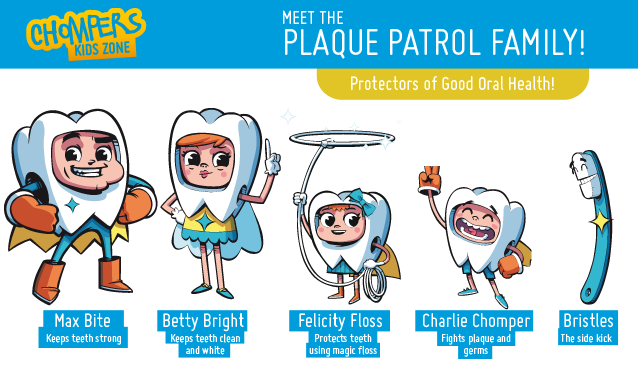 Meet the Plaque Patrol Family! 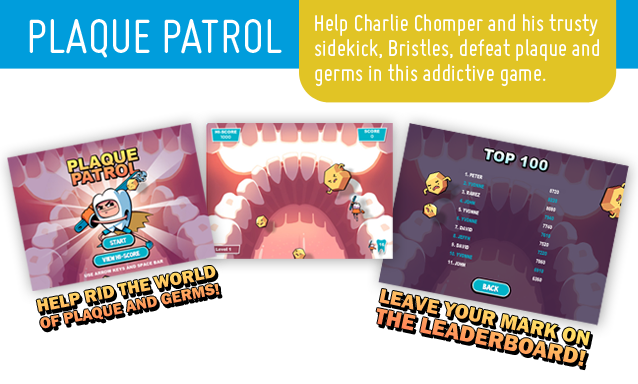 To learn more about the Plaque Patrol Family, the first family to fight plaque using their special powers, helping keep teeth clean all around the world. Don’t forget to also visit the main Chompers Kids Zone website here to download and print off your very own door hanger, brush chart and dot 2 dot colouring in drawings. At Baldivis family dental we recommend beginning to introduce your children to the dentist between the ages of 1-2 for their first check-up appointments. This way, they are not yet having any work or invasive treatment done but are gaining a positive first experience and outlook towards their dentist, whilst keeping an eye on the development of their teeth to help prevent any potential problems. For all bookings enquiries or more information contact us on the details below.